Cornwall to Northampton.. just a little trek for you...eek. You may well pass my house - ish - on your way, but please don't put yourself out. Yeah that'l be a long day. I got back to my house from cornwall around 4pm after having done Exeter to Bicester with no stops and I basically couldnt bring myself to do anything else until the morning. PM me closer to the time - if we can work something out, maybe I could sort you out a brew/lunch. I'n not doing it in one day this time as I cant face over 14 hours in the car again. When I first moved down here I was going back up to Northampton every 7 to 10 days for 3 months before my wife and son could move here. In the end I bought a house without my wife having seen it, only a phone call to describe it to her before committing to buy it. you will need to insulate it, not only to keep it warm, but to cut down the condensation that will cover absolutely everything in there when you start working in the cold winter evenings. the cold i can tolertate, but the condensation on the inside of a tin shed needs to be seen to be believed!! you neednt believe me, but dont forget to post in the spring that i was actually right!! it would be better to do it now, because the place isnt full of bikes, bits tools junk etc etc etc. 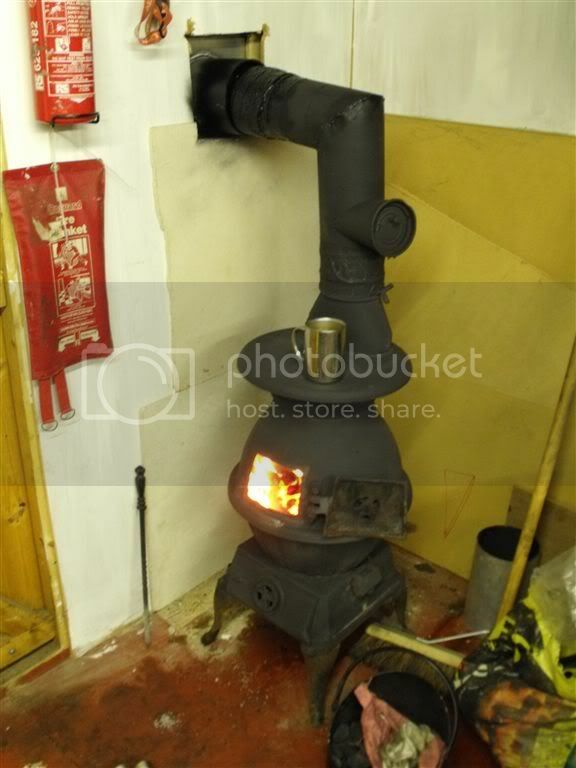 i insulated most of mine in he spring and just this weekend fitted a woodburner ready for the cold weather!! ahh bliss, warm and cosy for the winter!!! johnr wrote: ahh bliss, warm and cosy for the winter!!! Thats a nice set up. I doubt I will have the cash this winter for that. I might be selling my 205 soon but even if I can set some aside for me, I should put it into the enfield. is there a tunnel to the local pub under the stove? Might still be there, but there was a similar stove in the Antique's Loft in Cromford Sunday just past. Might be worth t'lad or his Mum checking tomorrow.